Many businesses and individuals use spreadsheets to store and handle data or automate calculations. Sometimes they wish that they could do more with that data; but lack the skills to take it further and design their own spreadsheets. Often it is a case of lacking the mathematical confidence or an understanding of Excel; else they have assumed that the problem is too complex for a spreadsheet. Excel is not restricted to simple calculations; but has several hundred functions in many different categories; from accountancy and financial modelling, to Mathematics, Science and Engineering or Statistics. Others will search a whole column or row to find a particular value or close match, or pull in an item of data from a linked sheet. The resultant saving of time is the greatest benefit for a business user. A calculation which might have taken nearly an hour is done in seconds; the time spent is merely that required for inputting the raw data. Should a change be needed; there is no need to repeat and check a tedious calculation; merely re-enter the updated item(s) and it is recalculated. The result can be printed out and presented to your client, accountant or whoever. 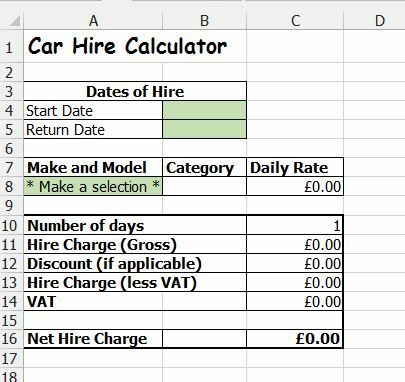 Car Hire Example: This is a fairly simple demonstration where the hire charge for car is calculated from the two dates entered and the Make/Model chosen. Download and explore it here. Should you change the Spreadsheet too much and it no longer works properly…. download a fresh copy. Invoice Template with automated aspects. Can be customised for you.